Skip the long lines at your local post office by ordering Christmas postage stamps online! Postage can be ordered from the following online vendors, though each have their strengths and weaknesses regarding price, selection and shipping speeds. Stamps can be purchased in sheets of 20 featuring a handful of designs and are valid postage for all 1 oz envelopes. (Rolls of holiday stamps are not available). The United States Postal Service (USPS) has a selection of Christmas-themed stamps for the holidays that you can buy online at face value plus $1.50 for shipping. Unfortunately USPS.com is the slowest stamp vendor—it can take 5-7 business days (i.e. 7-10 calendar days) to receive your stamps by mail. You can also order Christmas postage stamps from Amazon as well. You’ll pay a little more for a sheet of stamps but most of the stamps come with free 2-day shipping if you have Amazon Prime! This is a convenient choice if you already have an Amazon account and are a prime member. Selection varies but you can also find stamps from previous years no longer offered on the USPS website. 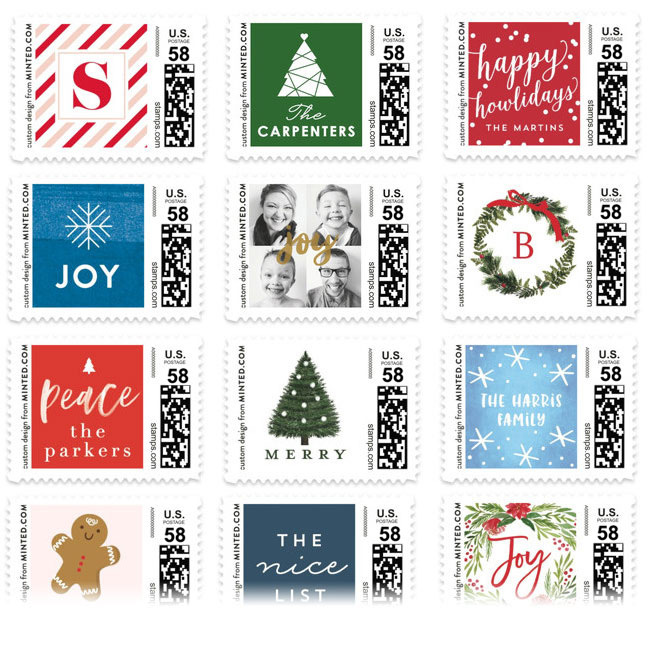 Minted offers over 3,000 Christmas postage stamps in contrast to the USPS and Amazon.com's handful of designs. Minted's wide variety of themes include snowflakes, joy, Christmas trees and more. You can personalize each stamp as well with your last name or initials. This is a great way to personalize the outside of your holiday cards. You can even coordinate your postage to match your holiday cards from minted for a beautiful look. Minted custom postage is also available in three different face values ($0.50, $0.71 and $0.35) which are not offered by the USPS for their holiday designs. This is the only choice if you’re sending postcards, 2 oz letters or square envelopes for your Christmas mailings and you want to have holiday-themed stamps. For more information see the information on postage rates. While Shutterfly is a popular choice for printing Christmas photo cards they only offer 5 custom holiday postage stamps. So unless you're already ordering Holiday Cards from Shutterfly the better choice would be to order custom postage from Minted where the choices include thousands of designs. Zazzle is currently not printing custom postage. Learn why Zazzle's Christmas postage stamps are no longer available. As an alternative to Zazzle, Minted is a great place to order custom Christmas stamps. With thousands of design choices and countless satisfied customers they are a great alternative to Zazzle this holiday season for ordering custom postage and Christmas cards.